Happy Monday, everyone!! I’m SO excited because my spring collection launches TODAY at 10AM MST! Here’s one of the dress part of the new collection! There are two more dresses, an amazing geo lace skirt, the daisy top and skirt (limited edition. These ones will go fast, they already sold out once so be sure to order it right away if you want it!!) and three new tops that look amazing with jeans, shorts or tucked into a skirt!! Also, I designed a mini collection of bows with Wunderkin Co. for your baby or little girl to match my spring collection!! If you’re wanting to wear any of the pieces a part of my spring collection for Easter Sunday, make sure to get your orders in soon!! I would love to get your feedback on the new pieces, what’s your favorite? what’s your least favorite? Thank you so much for your continued support and love!! I absolutely love the dress, is stunning! This is such a beautiful dress! Absolutely love it! Love that pink lace dress, it’s so beautiful! So beautiful! Congrats on your collection! This dress is absolutely gorgeous, Rach! I love the bell sleeves, the blush pink color, and of course the lace detail! 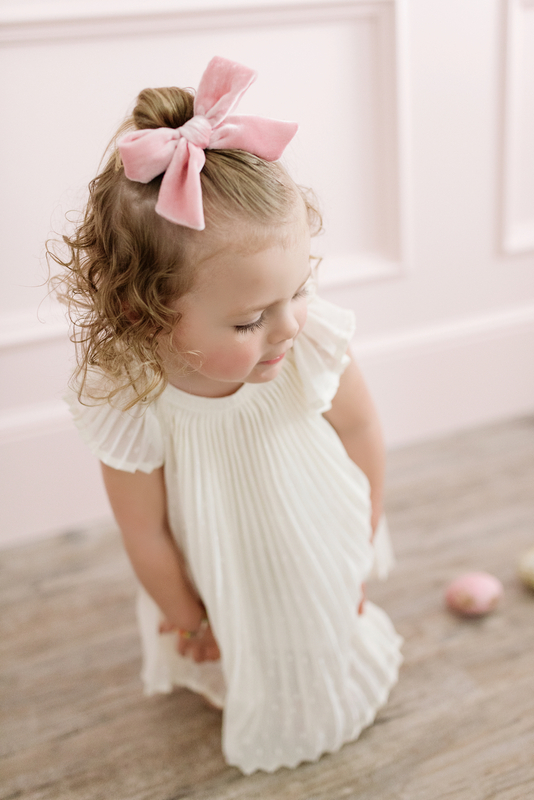 I can’t wait to check out the entire collection when it launches later today, as well as the baby girl bows, I’m sure they’re all cute! Thanks so much for sharing and I hope you have a great start to your week! Wooow love your collections..and this new dress is epic!!! omg this dress is GORG!! I love this dress; so feminine and chic! It reminds cherry blossom <3!! You nailed it! This dress is incredible and fits you like a glove! Congrats! I love the color of this dress and am excited to check out the daisy top and skirt! I’m obsessed with the Anglaise in both colors. I love a good, lacy fit and flare! There’s also a stunning white and pink long sleeve fit and flare dress on the home page but couldn’t find on the site that is my absolute favorite! Omg your stuff is gorgeous! Would you ever consider adding extended sizes? I can see these and some of the other dresses being used as bridesmaid dresses. They are soo dreamy!? Thanks Jaclyn!! Yes, we hope to offer petite sizes and plus sizes in the future! I’m really excited for everything to launch and to get a better look at everything. Love this dress though and can’t wait to see the entire collection. How cute is that pink lace dress! I love your spring collection! Omgosh this is the most gorgeous Easter dress I’ve ever seen!! Congratulations Rach! And of course Miss Isla Rose looks adorable as per usual! Love that bow! Congratulations on another season’s launch! Such a pretty pink dress! Beautiful dress! That color is amazing! The background couldn’t have been more gorgeous! I love a lot of dresses in your collection. Unfortunately, on me they would look like gowns. Would you consider adding petite sizes? My favorite is the pink. But, I won’t buy it, because of the length. I am 5’1. We are hoping to offer petite sizes and plus sizes in the future!! This is such a gorgeous dress! Love the lace and the color and the beautiful bell sleeves! Beautiful pics!! I love the dress! It is beautiful! Are you planning to create a children’s line as well? How cute would that be!?! You and your daughter is matching dresses! I haven’t given it much thought, but that would be super cute!! I think this spring collection is my favorite of yours yet! Love every single piece. I think i’m gonna get the azalea ruffle sleeve or blanc ruffle sleeve and maybe the geo lace skirt first. hopefully all of them eventually haha. Thank you so, so much Mickelle! I’m happy to hear you like them! I’m loving the spring collection! Especially the Rosette Lace Dress and the Geo Lace Skirt!! Can’t wait to go and buy my new Easter dress! I love Isla’a white dress. 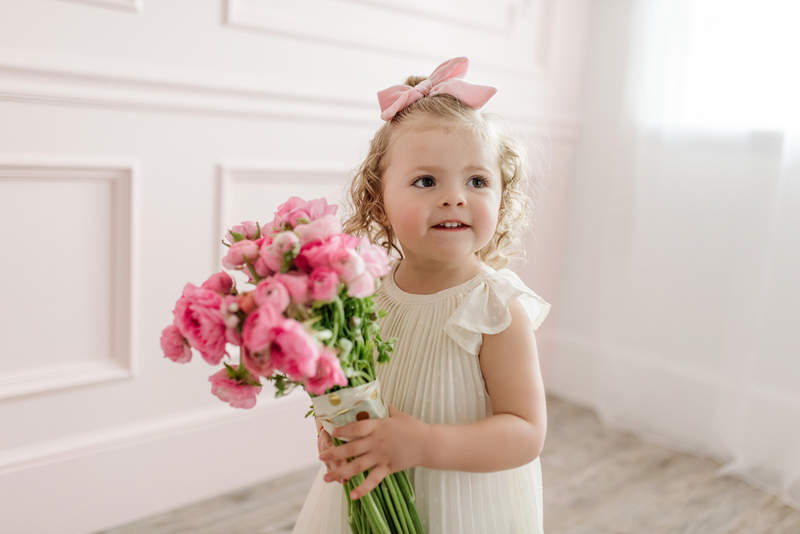 I am looking for a flower girl dress and that would be perfect. Where did you buy it? Thanks Christina!! It’s from Gap! Will you be restocking this dress? I am sorry to have missed it and would love to place an order! Very nice dress.Will you restock it? I love your collection! Sadly I didn’t make it over to order my Gracie Belle a bow before they sold out. They were super cute. Great job! I would love to see a matching mom and me collection (including sizes under 12 months) in the future. I looked high and low for matching mom and me dresses for Easter for my 9 month old and I. They are quite hard to find. We ended up getting ones from Matilda Jane. Hi! im trying to purchase your pink lce dress with bell sleves and the site says page not found..